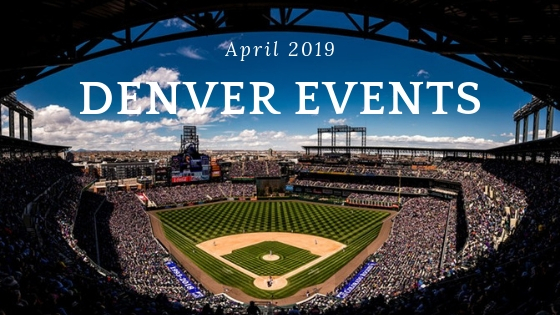 You are here: Home / Around Town / April 2019, Denver Events! A Coors Field is a must-see for anyone who , visits Denver. Located in the heart of LoDo, this magnificent landmark provides the ultimate event space for groups looking for a unique venue. Coors Field is proud to offer amazing venues that boast casual elegance, breathtaking views of the Rocky Mountains. Whether it’s a gathering of 50 to an opening gala of 10,000, our culinary staff will create the perfect customized menu that will make your event a , grand slam! Rodeo All-Star Weekend celebrates the sport and the athletes of rodeo with an All-Star festival feel. The weekend offers three All-Star rodeo performances, the popular Lunch with Champions, Mutton Bustin, mechanical bull and the all-star concert. Enjoy a good laugh with Dane Cook on his come back tour, Tell it like it is. Dane is a “comedian phenom and icon” by Entertainment Weekly, Dane Cook has maintained his reputation as one of today’s most prolific stand-up comedians while simultaneously distinguishing himself as a charismatic and versatile actor in a variety of film and television projects. A “Shark Tank”inspired event for nonprofits to vie for funding for a unique program. Join us for The TANK – Local nonprofits will pitch their organization or a unique program idea in front of community business leaders, philanthropists and YOU! WHY “THE TANK”?There are many amazing nonprofits doing incredible work in our community, now is the time for our community members to support these local programs. Six local nonprofits will pitch their unique program to ‘SHARKS’. This event brings the for-profit and not-for-profit sectors of the community together.